- Available in natural Grain Leather. - Cotton Stripe textile back, rubbberized cuff. We are majorly looking for queries from Gulf countries & Europe. Colored Split Leather Canadian Gloves, with colored cotton back & 7 cm rubberized cuff. Internal elastic on back with tips & knuckle strap. Five finger flannel lining. For our valued patrons, we are offering a high quality range of Safety Gloves that meets on client’s demand. Being one of the reputed organizations in the market, we are engaged in providing an exclusive range of Leather Hand Gloves. 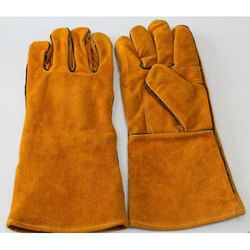 We are a reliable Manufacturer, Exporter, Importer and Supplier of Leather Winter Gloves from India. Only authority approved Leather is used in making Leather Winter Gloves in a variety of designs, sizes, colors and leather types. The gloves that we offer are comfortable to wear, durable and ensure optimum grip to the wearer. We are looking for foreign queries majorly from Malaysia, Europe and Africa. Keeping in mind the precise demands of clients, we offer a wide range of Leather Safety Gloves. These products are made from high quality components. 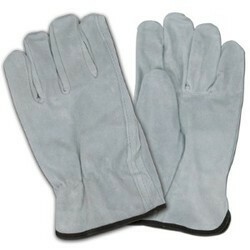 We are engaged in providing a wide range of Industrial Safety Hand Gloves to our clients.